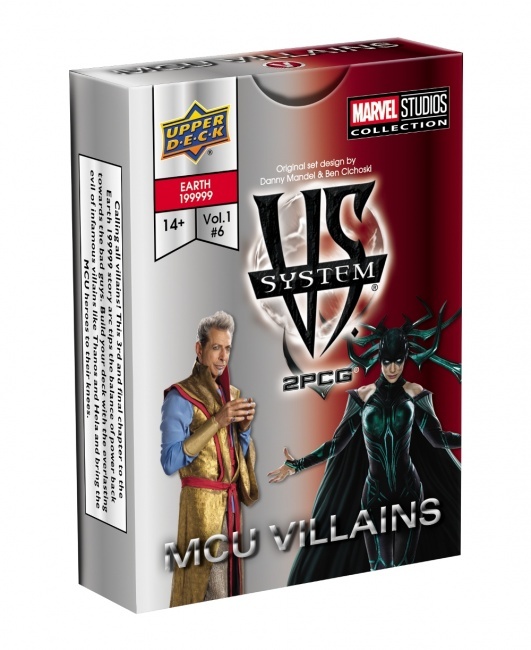 Upper Deck will release the MCU Villains Issue Pack for its Vs. System 2PCG in July. This 55-card Issue Pack is loaded with bad guys from the Marvel Cinematic Universe, including Thanos, Hela, and Dormammu. MSRP is $14.99. Upper Deck announced the Earth 19999 Arc (The MCU Battles) earlier this spring (see "The MCU Invades 'Vs System'"). This release will follow the Vs Stem 2PCG Issue: MCU Heroes release in June. The next theme will begin in August. See preview cards and larger box image in the Gallery below.